and watched it making a start on the nest. A very clever design with a sloping verandah which shields the occupiers from our heavy tropical downpours, it looks remarkably like a bit of flood debris caught on a branch. The birds enter the nest by flying up under the sloping verandah. I’ve been watching the building progress over a few days – there was no activity at the nest when I visited today although I could hear a call close by. The nest, in the RH photo looks close to complete. 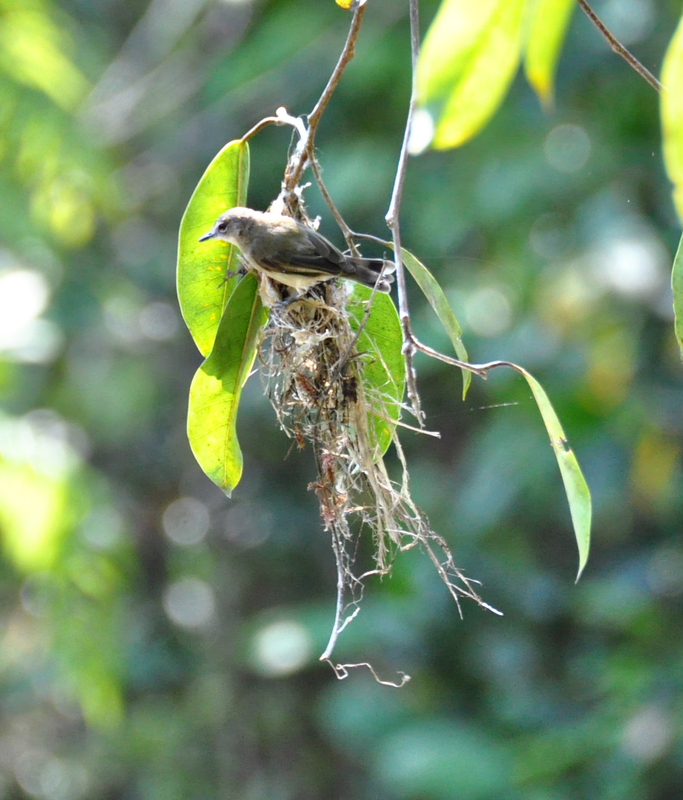 Another hanging nest; Brown-backed Honeyeaters returned for their breeding season after a few months absence during the winter. 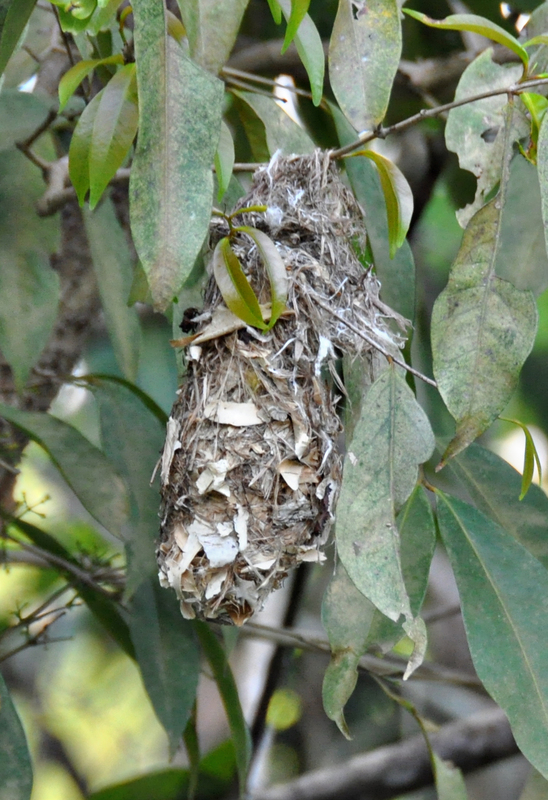 Their nest is a rounder shape than the Gerygone with a more obvious verandah over the side entrance and they appear to be very fond of using Paperbark from the various species of Melaleuca growing here. The photo on the right gives a better view of the verandah. 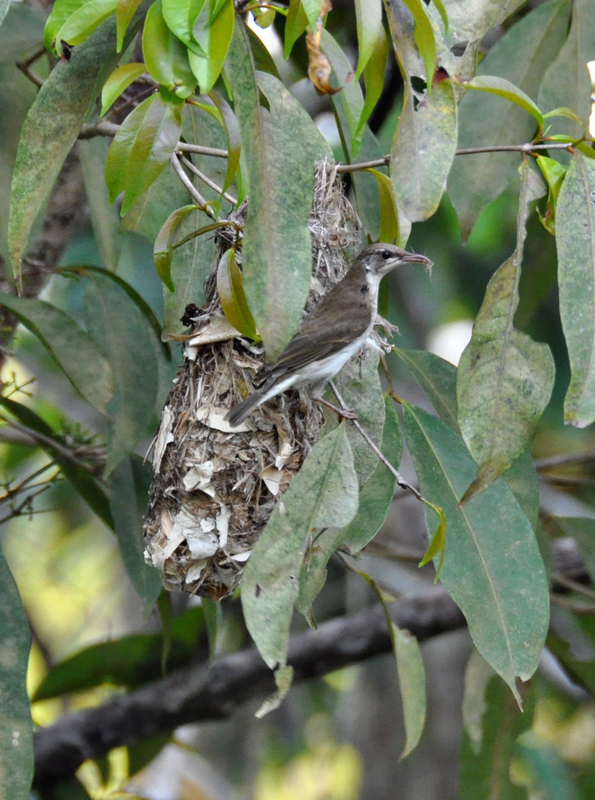 The Brown-backed Honeyeater parents were very busy cramming food into the noisy inhabitants of this nest on Rupert’s Island. I was sitting in the canoe – stuck in the muddy margin but my proximity was still a bit disturbing so I didn’t stay long. The afternoon light was lovely but as the sun sunk lower in the sky I sensed an urgency in providing adequate nourishment to satisfy the nestlings through the night. And in a different area of the property this BB Honeyeater was busy with nest construction – and still has quite a job ahead of it. This entry was posted in Bird Observations and tagged Brown-backed Honeyeater, Large-billed Gerygone. Bookmark the permalink. 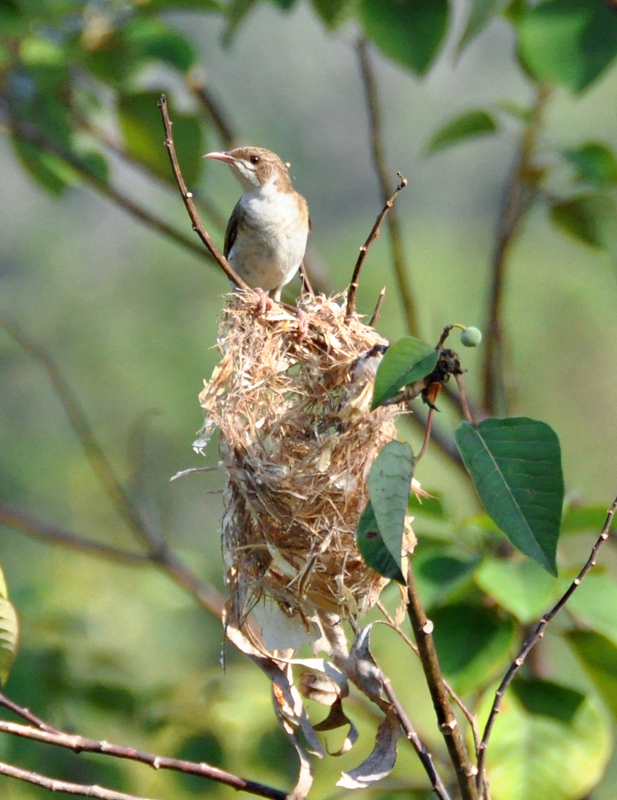 Its always lovely finding nests like those. I stumbled upon a Brown Thornbill nest a couple of days ago, just below knee height, in a heath shrub. Only the camouflage would save it from predation. But hopefully it will be all right. Your birds nests are right out in the open. Presumably more concerend about Tree Snakes than Currawongs. You may be right Denis although Black Butcherbirds are rather efficient at “cleaning up” nests. The Sunbirds have given up nesting on our verandah after successive Butcherbird attacks but there are plenty of alternative venues for the Sunbirds now. And of course Tree Snakes also check out our verandah – its a busy place some days!